I’ve always loved bottle brush trees and when I realized we already had all of the materials needed to make them, I knew we had to add this to the list. 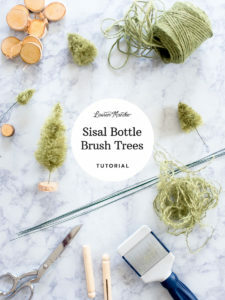 We are continuing our 12 days of handmade Christmas crafts with these diy sisal bottle brush trees. Watch the video below to see how you can make a festive Christmas tree forest for your holiday decorating with just twine, wire, and wood. Cut pieces of twine into 6" lengths. Unravel the twine pieces into individual stands. Break the stands apart even further until you have a pile of sisal fibers. Bend a piece of floral wire (about 20") in half. Insert a wooden clothespin at the halfway bend and twist the wires a few times to secure the clothespin in the wire. Allow about 8 inches of space and then twist the wire again a few times. Add the second clothespin and twist the ends of the wires to secure. Insert the fiber pile between the two wires in the space you left between the clothespins. Spread fibers out evenly to the height and density of your desired tree. Begin twisting the clothes pins in opposite directions many times until the fibers form a cylinder. Periodically and gently comb the fibers in an outward motion with a stiff bristle or pet brush to remove any tangles. Continue to twist until the fibers are secure and can't be removed with a gentle tug. Comb again to remove any loose bits, brushing outward. Remove clothespins. With scissors angled toward the top of the cylinder, trim the fiber into your desired cone shape of the tree. Cut diagonally as you turn the tree between snips. Once the tree shape has formed, comb and trim again. Cut the excess wire off, leaving enough for the trunk of the tree at one end. Drill a hole in the center of the wood disc, add hot glue to the end of the trunk and place it in the hole. Hold steady while the glue dries. Check back tomorrow for more holiday crafts as we countdown to Christmas!